To me, one scene above all other defines Warcraft, a movie as breathtakingly nonsensical as it is irresponsibly chaotic. A young, generic hero person who can sometimes burp blue flame, named Khadgar (Ben Schnetzer), stands in front of a pulsating box of gelatinous black goop. A door opens in the goopy box. Khadgar, with no hint of intentional comedic timing, asks a robed magic dude “So…should I go in?” To which the robed magic dude says “I don’t know. 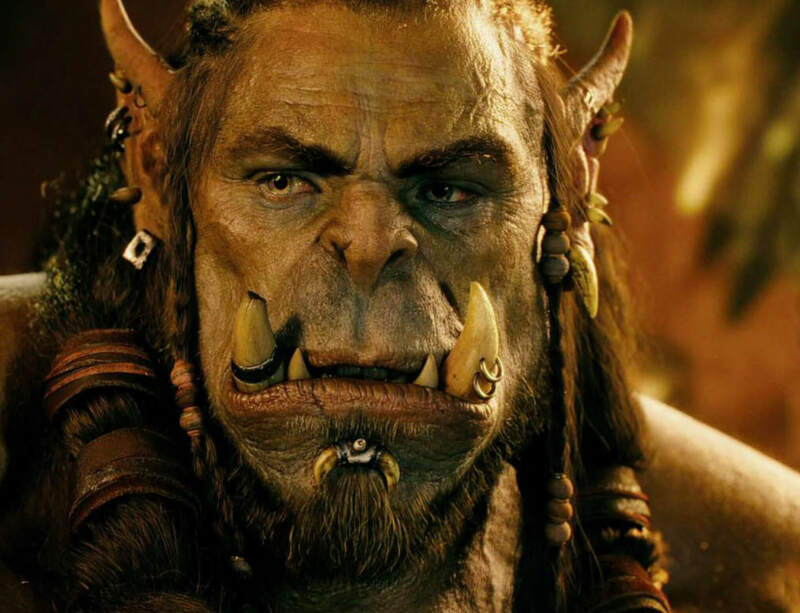 This has never happened before.” And that is Warcraft to me: A series of WTF moments blended with acting so impotent that full audiences now have permanent erectile dysfunction. As someone who has never played the video game Warcraft, this synopsis is going to be a trainwreck. And not the good kind, where, like, a caboose filled with bunnies spills out everywhere for free cuddles. This will be the gross kind, where toxic goo spills everywhere and doesn’t even turn anyone into a superhero. Alright, so apparently, fearsome orc warriors, who look like super-steroid professional wrestlers with the worst underbites ever, invade a realm filled with humans in order to kill them. That’s it. That’s the entirety of the plot. Now, some orcs are good and feel bad about people-murder; they’re light-skinned. Some orcs are bad; they’re green-skinned. I don’t think this was some kind of coded racial commentary but was done so that people like me could understand why some of the orcs were hitting other orcs with big hammers and how they decided which orcs to hit. The humans… God, I legitimately don’t know where to start. Um, one of them is called Lothar (Travis Fimmel), and he seems really angry, probably because he still has a mullet. And there’s something called a “Guardian” named Medivh (Ben Foster), who doesn’t actually seem to guard anything and gets really bad acne after peeing green magic into a blue pool. And there’s something about a portal that has to be closed from each side or something. Look, it’s mostly just a lot of loud noises and people barfing colored magic air. The one good thing is that the orc’s eyes are really well done. I’m serious! For the longest time, the “uncanny valley” that existed in making CGI characters seem “real” had to do with this strange, off-putting deadness in their eyes. I didn’t feel like the orcs were actively trying to steal my soul from my body when they had close-ups. So that was good! Also good was…nothing else in the movie. I am told that fans of the video game are enjoying Warcraft. Awesome! I loved Duncan Jones’ Moon and am totally rooting for the guy. I also know that films like this, by their very nature, have to deal in a great amount of fan service. I’m just not a fan, and there is nothing in it for non-fans. At all. So, oh dear God did I hate this movie. One day, there will be a video game adaptation than unites lovers of the original genre and movie lovers. This is not that day.